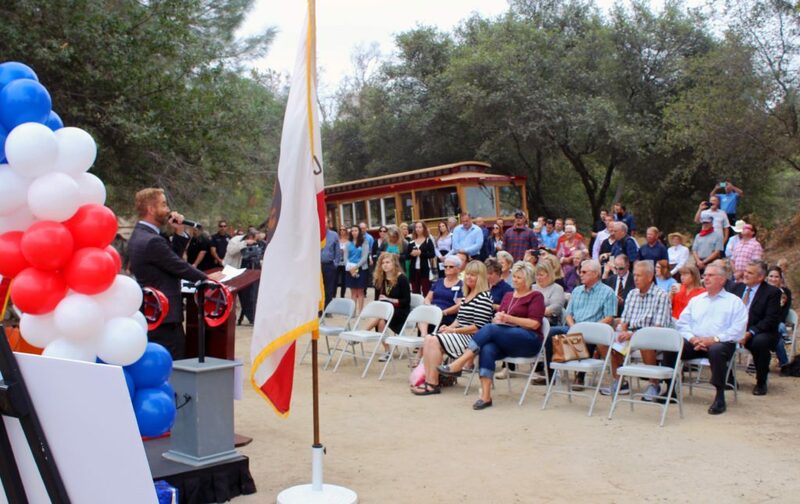 More than one hundred community leaders, partners and families from the Rocklin community were excited to take part in the groundbreaking ceremony for Quarry Park Adventures held on September 14, 2017, at Quarry Park. 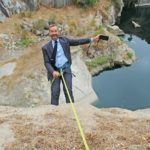 The event included ABC10’s Mark S. Allen repelling from a 70-foot cliff in Big Gun Quarry, historical perspective from Vice President of the Rocklin Historical Society Holly Clark, music from the Whitney High School marching band, and much more. Emcees Bob Hilton, Rocklin’s Business Development Manager, and Mark S. Allen led the festivities. Guest speakers included Rocklin City Manager Rick Horst, incoming Rocklin Chamber President Chris Dancy, President of Quarry Park Adventures David Busch, and Rocklin resident Paul Ruhkala. Speakers shared their enthusiasm for the project and looked forward to the economic development benefits it will bring the Rocklin community. “What is 445 feet long, 85 feet wide, 70 feet deep, 156 years oold and will be enjoyed by tens of thousands of families in the Sacramento region,” asked Busch, referring to Big Gun Quarry, the site of Quarry Park Adventures. The speakers were upstaged by 98-year-old Roy Ruhkala, Who stole the show by initiating a visual pyrotechnical display in the quarry that concluded the ceremony. Quarry Adventures is intended to provide family entertainment both tourists and local residents with a mix of rock climbing and adventure related offerings augmented by quality food service and small retail stores. The project has the potential to be a catalyst for commerce and development in Rocklin’s Quarry District, attracting customers to local businesses and generating tax revenues that could be used to sustain vital services and quality of life in the City.